Class starts again 11th September 2017. 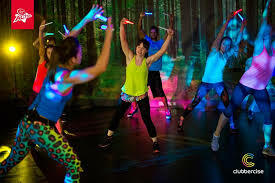 Clubercise is simple, fun dance fitness routines using glow sticks to club anthems from 90s classics to the latest chart hits taught in a darkened room with disco lights. Because of the high and low impact options, Clubbercise dance fitness classes are great if you’re a beginner or if you’re already a fitness freak!